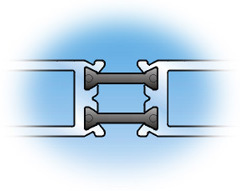 A key component to thermally broken systems by YKK AP are the 6/6 nylon polyamide glass fiber reinforced pressure extruded bars that join two separate extrusions into one thermally broken frame. The MegaTherm® aluminum framing system offers unmatched performance and durability by saving energy and reducing condensation. 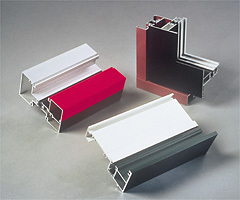 The polyamide material is much stronger and has a higher melting point than PVC or polyurethane used in other systems; and since its coefficient of thermal expansion is very close to aluminum, the bond between it and the extrusion maintains structural integrity through a wide range of temperature fluctuations. In addition to providing an effective thermal barrier, the MegaTherm® aluminum framing system also allows dual finish options. Some unique design effects may be created by changing finishes between the exterior and interior exposed surfaces. Using different exterior/interior finishes may also achieve cost savings on larger projects by putting a less costly finish on the interior surface. For additional information about the full line of quality products and services offered by YKK AP, consult our nearest office or sales representative.